HDon't read this book with your back to the cellar door! Although this third in the Suze Figueroa series starts out as a Chicago police procedural, the mood grows eerie as the pages fly by. Officer Figueroa and her partner, Norm Bennis, are handling their usual pickpockets and burglars when a sizable number of the force's detectives are incapacitated by a bout of food poisoning after a banquet. Temporarily promoted to detective, Suze and Norm must quickly track down a serial killer and a child molester before each has a chance to strike again. The murderer targets the homeless, getting them drunk and suffocating each by a different method. Undetected, the child molester secrets himself in Figueroa's large house to revenge her interruption of an earlier crime. He prefers preteen females, gleefully finding two of them, Figueroa's nieces, in the house. The policewoman's son, J.J., is just trying to survive preadolescence with a mother who must be gone more and more as the murders multiply. Police profiler Jody Huffington and a Northwestern University psychiatrist, Dr. Ho, help the temporary detectives to understand the minds of serial killers and child molesters. The denouement cuts close to the cops' lives and is written in such terrifying terms readers will find it easyDno, mandatoryDto stay up all night to finish the book. (Dec. 7) Forecast: Anthony and Agatha Award-winner D'Amato, Mystery Writers of America president for 1999-2000, handles a tired theme, the psychopathic killer, more tastefully than most. 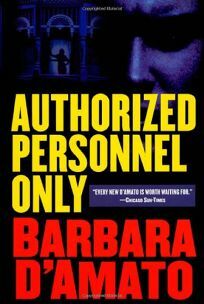 If booksellers emphasize this to prospective buyers, the title could attract readers who love suspense but not gore.